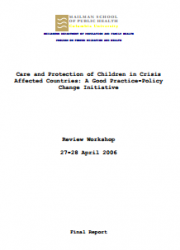 This is the final report for the 2006 CPC Review Workshop, which includes strategies for establishing the fieldwork partnerships required for advancing the CPC and strategies for maximizing practice and policy influence of the work. 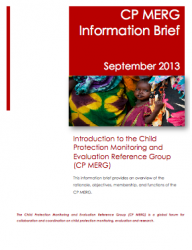 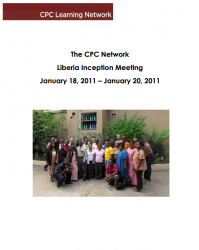 This brief provides a summary of the CP MERG's history, mission, goals, and membership. 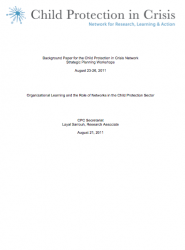 This paper addresses some of key issues of organizational learning in the humanitarian and child protection sectors, looks at the role of networks in learning, and presents a series of questions and thoughts to stimulate discussion and reflection on how to help professionalize the child protection sector and the role of the CPC Learning Network in that process. 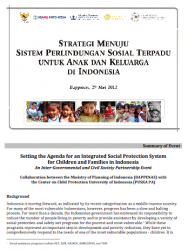 This is the summary report of a meeting held in May 2012 to bring together BAPPENAS and the Center on Child Protection at the University of Indonesia as a first step in building a long-term partnership and explored current achievements and gaps in social protection programming.